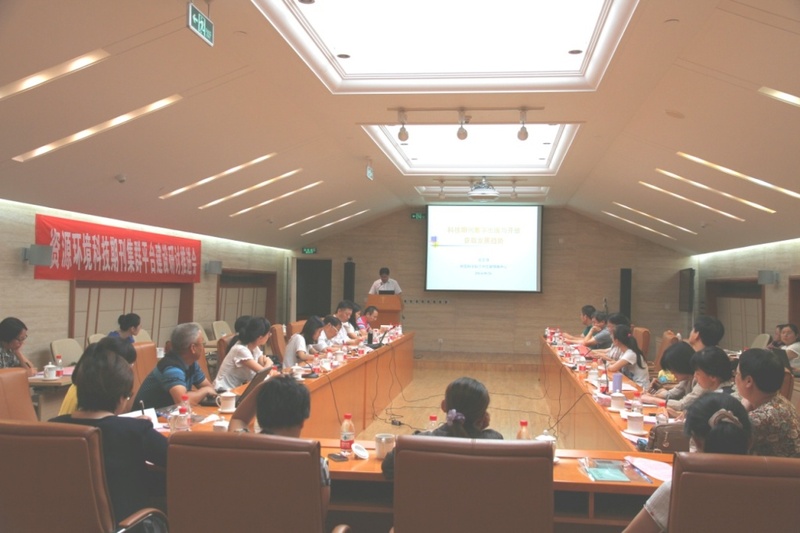 The Meeting of Library of Resources and Environment Sciences (LoRES) journals cluster platform construction was held on Aug. 26th, 2014 in Beijing, which supported and guided by the Bureau of Science Communication, Chinese Academy of Sciences(CAS), and organized by Lanzhou Literature and Information Center(LLIC),CAS. Zhou Dejin, director of Science Communication, CAS, directors and editors of academic publications such as Acta Ecologica Sinica, Journal of Geographical Sciences, Acta Petrologica Sinica, and more than 30 journals, editors and engineers from Journal Editing and Publishing Center and Information Technology Depatment in LLIC,CAS, as well as head of Beijing Mag-tech Technology Development co.LTD. attended this meeting. The meeting was presided by Zhang Zhiqiang, director of LLIC,CAS. Zhou Dejin pointed out the academic journals strongly development trends show more marketing, globalization, digital, specialization, and cluster platform at the promoted of information globalization, new data intensive scientific research paradigm and open new academic interaction development.Therefore, academic journals must be updated ideas of journal publishing and academic interaction, explore and participate in promoting academic journals open cluster platform construction and professional development. Zhou Dejin emphasized that the purposes of the meeting are to further promotes the project progress of the the resources and environment science and technology journal cluster platform construction, expand the number of journals on the platform, and develop new model of open access through depth discussion and exchange of academic journals. At the meeting, Zhang Zhiqiang made a report, titled development trends of digital publishing and open access journals of science and technology, which focused on international journals cluster platform constructions and the open access journal policy development, as well as challenges and enlightenment for Chinese journals; Hou Chunmei, the director of the Journal Editing and Publishing Center of LLIC, CAS, made a report, titled Library of Resources and Environment Science (LoRES) journal cluster platform construction and development, which introduced the progress of construction and application of LoRES open access journal cluster platform; Lin Jiale，general manager of Beijing Mag-tech Science and Technology Development Company, made a report, titled the articles‘ ways to the future; Zhu Zhongming, the director of the Information Technology Department of LLIC, CAS, made a report, titled the scientific knowledge of open application and semantic correlation organization. The LoRES journal cluster platform construction should be fully recognized, and the journal cluster platform construction can solve the problem of “information island” of single journal publication, and platform of professional academic journals cluster is integrated to promote the coordinated development of academic journals, which plays an important role in improving journal influence. Participants disscussed on digital publishing, open access journal cluster policy, document format data processing and platform construction of cooperation and sustainable mechanism in the meeting. As the director of the journal cluster platform project, professor Zhang Zhiqiang made an acknowledgment to colleagues attended the meeting for the valuable opinions and suggestions. Finally, professor Zhang emphasized that is the new starting point of the resource and environment science journal cluster platform construction, and the meeting expands vision for the next step in the journal cluster platform development. He hoped the LoRES platform will reach a high level on open access, professional academic journal cluster platform in China through relevant journal editors fully support and diversified cooperation. So professor Zhang suggested that we should strongly promote the open knowledge dissemination and academic exchanges of resources and environment science and technology innovation .